How to use Combo Box (Drop-Down list) in Java using Swing API ? 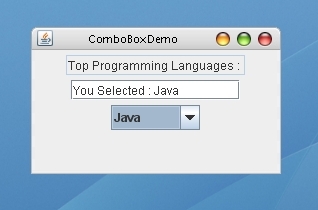 A Simple program demonstrating the use of Combo Box (Drop-Down list) in Java using Swing. Video tutorial to demonstrate how to use Combo Box (Drop Down list) in Java using Swing API. Video tutorial to demonstrate how to create a simple Swing Application in Java.